The lamb steaks are rolled and stuffed with a sprinkling of prunes or apricots and wrapped in bacon. These tangy lamb parcels are suitable for home freezing, once prepared to item 3 below. Defrost thoroughly before cooking. Cover the lamb steaks in cling film and on a flat surface pound them with a rolling pin until almost double in size. Combine the turmeric, cinnamon and seasoning and lightly dust each steak with the mixture. Sprinkle the prunes over the steaks, roll up tightly and wrap each in a rasher of bacon. Secure with a cocktail stick. Place on a baking tray in a preheated oven 200°C, gas mark 6 for 15-20 minutes or until thoroughly cooked. Meanwhile bring the stock to the boil, add the cornflour and continue to boil until thickened. Add any meat juices and sediment from the baking tray. Gently heat the orange juice, pour over the couscous and sultanas and allow to stand for 10 minutes. Fluff up with a fork and heat gently. Add the pistachios, coriander and plenty of seasoning. 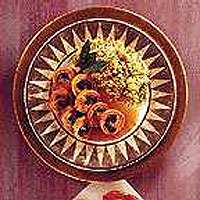 Slice each lamb parcel into 4 and serve accompanied with the couscous and sauce.